charliedontskate.com :: View topic - Ash Grunwald rides a CarveBoard too. Ash Grunwald rides a CarveBoard too. 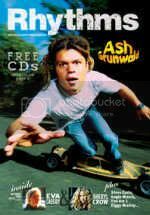 Posted: Mon Oct 27, 2008 9:36 pm Post subject: Ash Grunwald rides a CarveBoard too. Could'nt help myself had to post this shot of Australian Bluesman Ash Grunwald. I suspect that it might be the first cover shot for a Carveboard on an Aust. magazine as well.